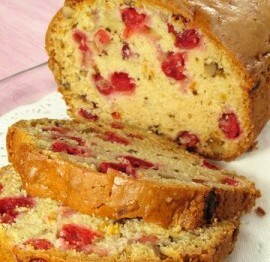 Here is a delicious cranberry bread recipe. It is called a bread or cranberry loaf, but it really is a cake, similar to a coffee cake. Cakes like this, such as banana bread and zucchini bread are not yeast breads but because they are baked in a loaf tin they are often referred to as breads instead of cakes. Sift dry ingredients together in a bowl. 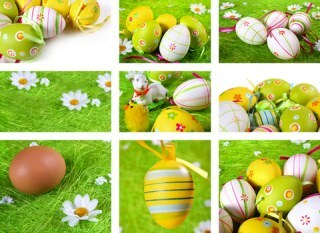 In a separate bowl, mix egg, butter and orange juice together, then add to dry ingredients. Mix in cranberries, walnuts and raisins (if using). Pour or spread into 9x5 inch greased loaf pan. Bake at 350°F for about 1 hour and 15 minutes. Test with a toothpick or other tester to make sure it is cooked right through. Cool slightly before removing the loaf from the pan. Quick bread recipes tend to be a bit denser than a regular cake recipe. They are perfect for slicing and enjoying with a cup of tea or coffee as a light, sweet snack. The addition of the orange juice is a nice complement to the tart cranberries and the walnuts add extra nutrition and crunch. Of course you can leave the walnuts out of the recipe if you prefer a nut free cranberry cake, but they really add a nice bit of texture to the bread. I think you will love this easy cake recipe. It is one of those cakes you will want to make a few of. Eat one and freeze the others for unexpected company. If you do like this recipe, I’d love you to Pin it to Pinterest, Tweet about it, Like it on Facebook and leave a comment below. Submit your own recipe below in the comments section. I would love to help you share your creations with the world. 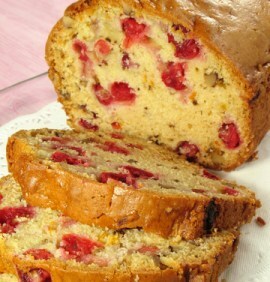 If you like this cranberry bread recipe you will want to have a look at our banana bread recipe too. You will find it here.